When it comes to the Sirius LED it's all about style and appearance. A beautiful unobscured house number sign with a clear polished frame, low profile design and hidden fixings are just its daytime persona. At night time however, it comes to life in spectacular form. Your choice of colour illuminates with a vitality that is unsurpassed, creating a lasting impression for anyone visiting your home. Sirius LED signs start from just. Sirius offers a wealth of colours and fonts to select from and bring to life in beautiful illumination, making a bold statement in your own style. The text colours have been specially selected for their vibrancy when illuminated. 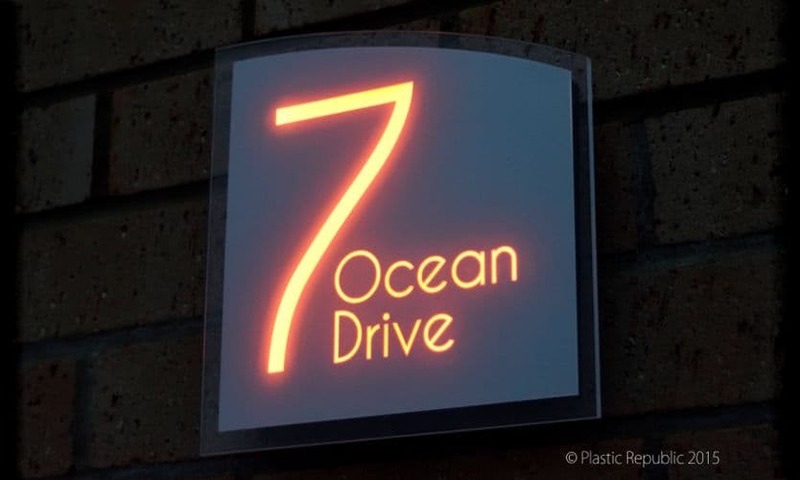 Select any of the carefully chosen fonts, and with an abundance of main colours you can create a truly authentic bespoke house number sign. 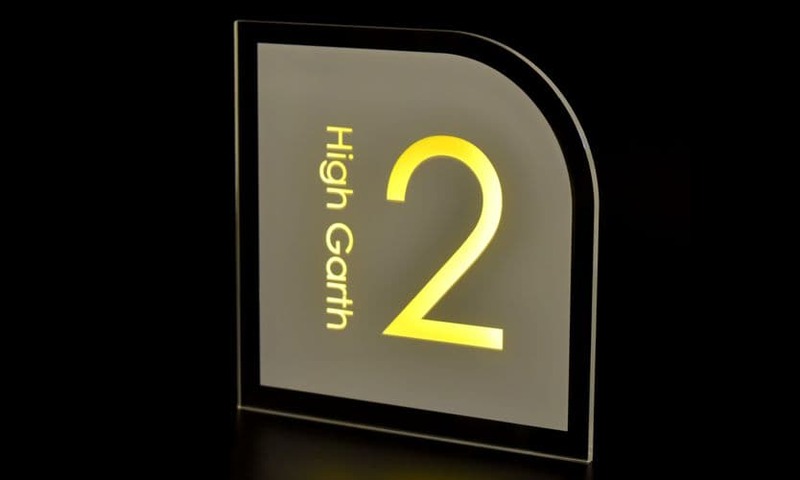 This is the smallest size from our Sirius range of LED signs. It's a perfect size for hotel rooms, apartments and many homes. Measuring 165mm x 165mm (6.5" square) with a slim 12mm depth it looks fantastic on any wall inside or out. The Sirius 215 LED sign is a larger version of the 165 above. It's an ideal size for many homes and businesses and large enough for the neat option of an external power supply fitted to the back of the sign. Measuring 215mm x 215mm (8.46" square) with a slim 12mm depth it looks fantastic on any wall inside or out. 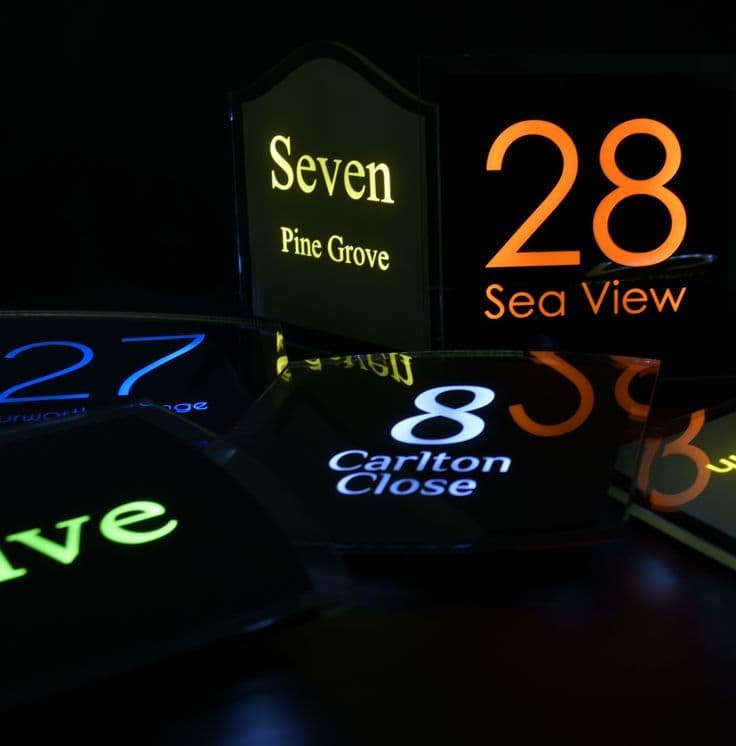 Fabulous signs that look beautiful in the daytime and WOW at night time. The Sirius is assembled in layers with the first layer being the front plate and a second light plate with your design. Being applied on the reverse with a clear border shows its true quality and allows for the depth of colour and lustre to shine. A second layer is the LED light plane and reflector. 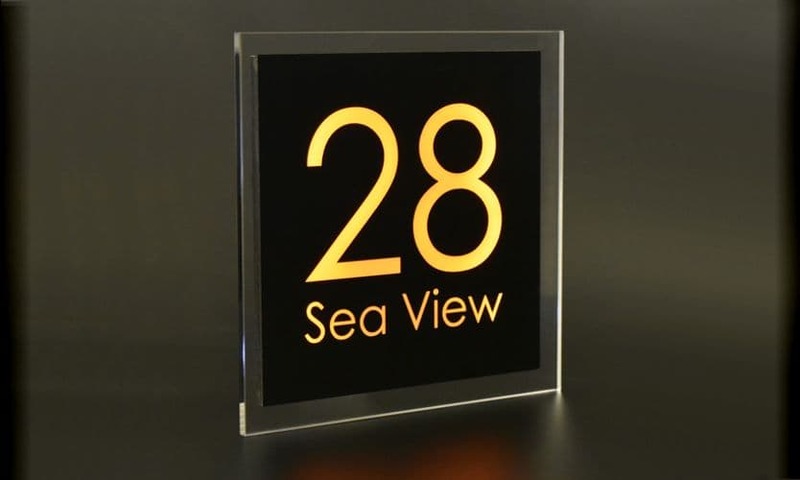 This incorporates your design details to be illuminated with super bright, super thin LED's embedded around your design. The third layer is a super strong waterproof flexible bonding gel, which bonds a gloss black acrylic back panel to the front. 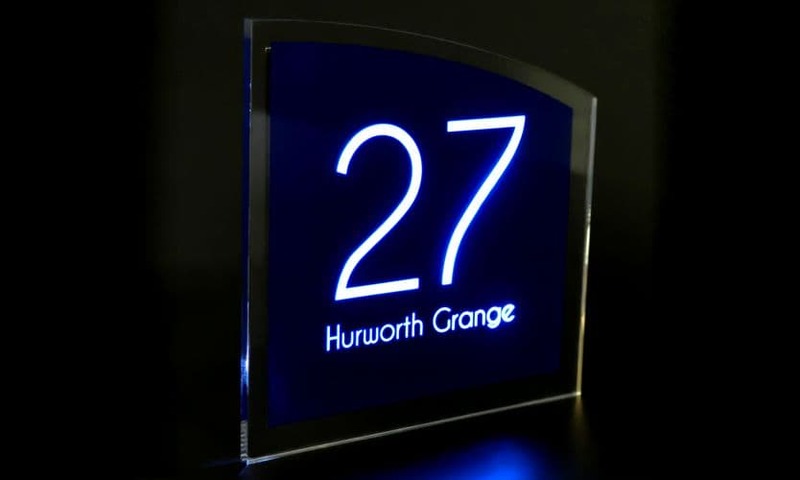 Your design is accurately created and cut from the finest quality acrylic and vinyl, ensuring durability and colour vibrancy. The complete assembly is tested for bright, even illumination and weather proofing. Your finished Sirius LED sign is inspected, cleaned and safely packaged for our ultimate goal of providing you with a quality product that we took pride in making. Clear 5mm Plexiglas acrylic front plate, 3mm Plexiglas acrylic back plate, 3mm Plexiglas acrylic light plate. UV stable. See size selections above. Thickness of sign is 13mm, Minimum 16mm stand-off space from the wall. up to 6 design shapes available in most size selections. 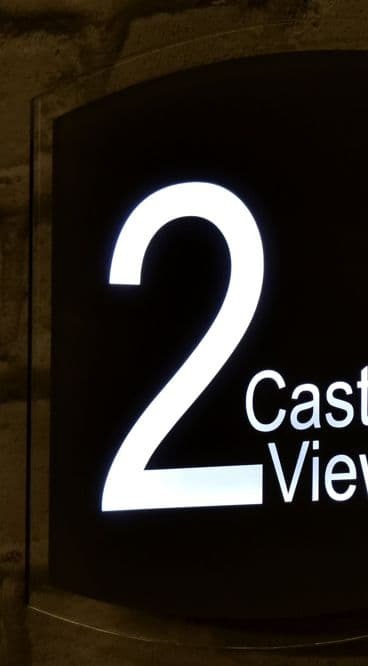 Sirius LED signs are 12 volts. Starting at 0.5 Amp. See sizes above. 1x assembled Sirius LED sign, 1x LED driver embedded or not-embedded, Screws, Wall plugs, Wall spacers, 1x drill template and instructions.